Touring motorcyclists can learn a lot from the traveling light strategies employed by backpackers. When a hiker has to carry everything he or she will need for several days, every ounce of gear and clothing carried becomes important. Because necessity is often the mother of invention, backpackers take only what they absolutely will need and each item usually has more than just one use. 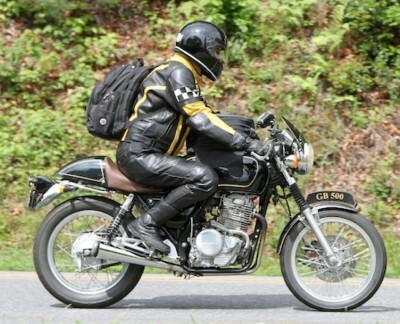 For touring motorcyclists, however, traveling light is often more about bulk than weight. The goal of taking only those things you will need, however, still holds true for us two-wheeled adventurers. During a recent three-day tour on a café racer-type of bike, I was able to carry everything I needed in a small backpack and tankbag. It would have been nice to have more storage space, but I, indeed, did have everything I needed. This included a digital camera and an iPad for downloading photos. Protective motorcycle riding gear: full face helmet, boots, gloves, jacket, sunglasses and pants (perforated jacket and pants in summer) If room permits, I also throw in a pair of casual shoes. A hydration pack (for use in both warm and cool weather) and power bars, in case food stops become scarce. Rain gear, which provides additional warmth if the weather turns cold. Small digital camera and batteries or charger. Smart phone (and charger) for monitoring weather and calling for help, if needed. Critical personal information: name, next of kin phone number(s), medications, drug allergies, blood type, etc. Maps and/or GPS device (I usually take both). Fresh underwear and socks for each day of the tour. One pair of bicycle-type shorts for riding comfort, which are aired-out or rinsed each night, as necessary. Two form-fitting synthetic shirts, which are rinsed and air-dried each night (like those sold under the UnderArmor brand, which hold perspiration close to the body and provide an evaporative cooling effect). A light weight long-sleeve turtleneck for cold mornings and whenever additional insulation is needed. A minimal toiletry kit, which includes any daily medications. A polo type shirt and a pair of jeans for casual wear after the day’s ride is complete. OK, I’ve probably forgotten something or maybe you have a completely different list of essential items. Anyway, let us know what’s on your list of “must have” motorcycle touring items. The list of the essential items for motorcycle touring is excellent. We'll leave the list of camping gear for another day. Yeah! I love traveling light. We can always escape those nasty luggage fees. There certainly is a difference between packing in biking than hiking because in hiking, you carry the backpack which is quite heavy but in biking, the bike carries the weight which is lighter especially when mobile. I'll make sure to remember all these things because I am the type to bring along everything considering that I am a girl. I did this once but I didn't enjoy the ride at all and it was risky too. Thanks for pointing this out. I have a friend who joined a bike trip one time and he expressed disappointment over his travel because of the inconvenience of carrying a heavy bag while riding. Perhaps he didn't do research prior to the trip. Thanks a lot for sharing these wonderful tips. I know that packing for rides ain't that easy. You have to be wise with whatever you need to bring so it will not add up to the weight you are carrying. It will be such a burden to have heavy package. Comprehensive list. Glad i read here. Thankx a ton.